© AMNorman 27th July 2012, Mornington. 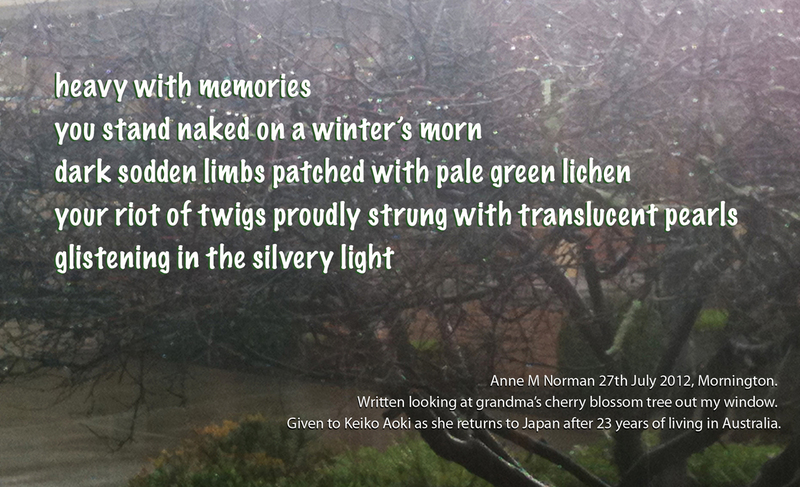 Written gazing at grandma’s cherry blossom tree, dripping from a recent shower of rain. This entry was posted in cherry blossom poems. Bookmark the permalink. Once I heard an interview with Bruce Springsteen saying his lyrics are “cinematographic” – these verses are like that – they draw me in to your experience with the tree, the lichen, the memories… for me that’s what art should be – a direct experience – thank you! thank you. you encourage me to write more such poems.